Between Lattes: Big Blog Exchange 2013: What a ride! Big Blog Exchange 2013: What a ride! Is it premature for me to be writing this? I'm an optimist (or at least I'd like to think so)... but I'm also a realist. So whilst I most certainly hope it is, I'm thinking not. It was my bad, to be honest; you know, this habit of deleting emails before even opening them. Although the initial invitation came in much earlier, I guess I must've accidentally deleted it together with those irritating spam mails from people trying to sell you anything from fake Rolexes to half-priced tadalafil. And to be honest, when those good people at Hostelling International (HI) sent the invite again in early-April, it was by mere inadvertence that I'd opened the email. A contest was on; one for bloggers! And one which awarded winners the opportunity to swap places with another paired winning blogger from somewhere in the world! How could I have missed this one?!! I was kicking myself in the teeth. I wanted this one bad... reeeeeal bad; and I wasn't about to let the opportunity of a lifetime pass up. But was there still time? After all, a whole month had passed since the contest began and I was wondering if it was too late to participate and still have at least a half-chance of a decent run-in; never mind winning. But to not do so was never an option... I had to give it a go; especially when two winning slots have been reserved for small-time, less popular, late-entrant bloggers like me. I duly signed up on 3rd April and immediately launched a ferocious vote-garnering campaign on Facebook. I even had some of my customers at the shop vote for me. It started off really well and within a week, I was sitting pretty at the fringes of the top 100-ranked participants in the world. More importantly, I was slowly but surely gaining ground on the lead pack from my region, i.e. Asia Pacific (there were four in all). I was absolutely relentless in my quest for votes from family, friends, employees and customers. During the first 11 days, I sat in front my PC well into the wee hours; pestering - even harassing - whoever was unfortunate enough to come to my mind to vote for me. I could swear I was becoming a pain in the you-know-where to many. But the effort paid off as my ranking was creeping steadily up the table - one, two and sometimes even three spots at a time. The idea was to get myself into the Top 25 in my region in order to qualify for the next round. 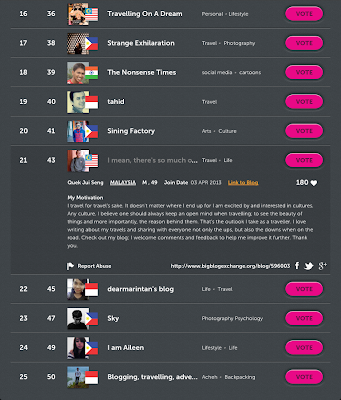 By 14th April, I was ranked 21st amongst the top 25 participants from Asia Pacific. Voting was to close the next day and, if I was still in that lead pack by then, I'd automatically qualify for the next round of selection. I was confident. See you in the final draw! 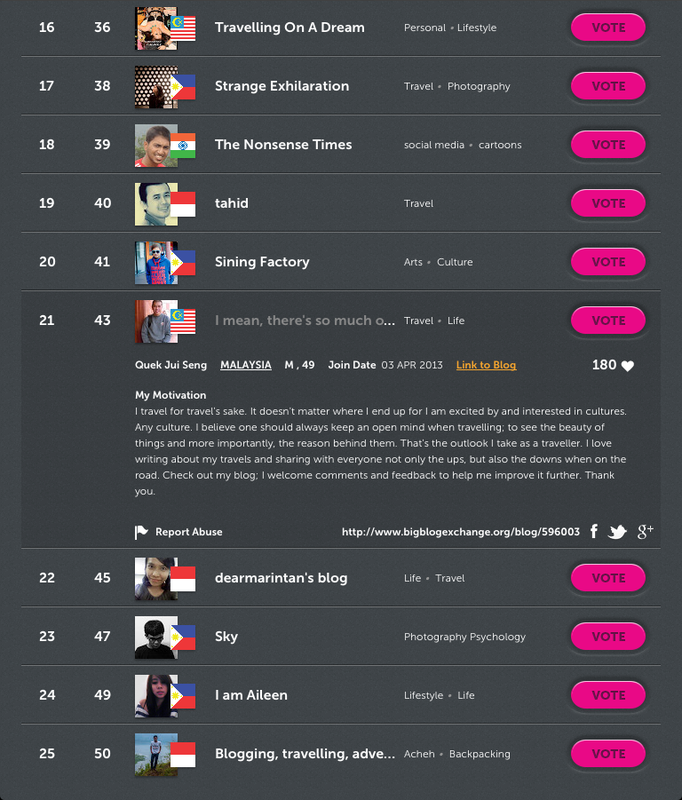 In the blink of any eye, my Asia Pacific ranking had dropped... no, plummeted from 21st to 26th to 30th to 32nd and finally to 36th, which placed me well outside the qualifying positions. 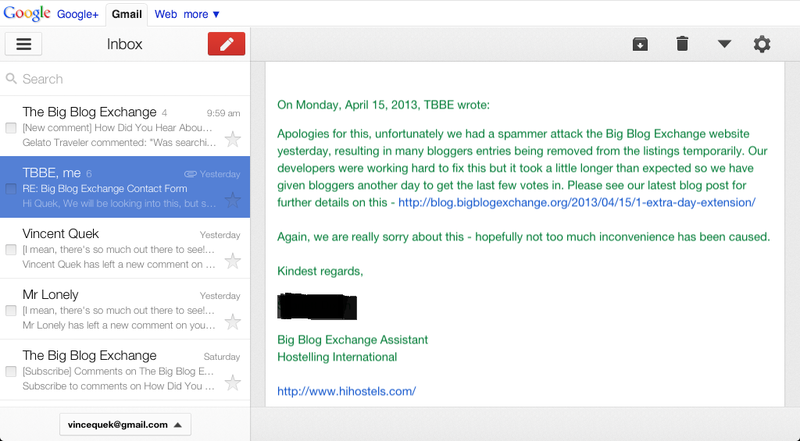 A quick, distressed email to HI seeking clarification for the abrupt drop drew this response from them. I was gutted. Another day's extension wasn't going to be of much help as the number of votes garnered by those in the top 25 were light-years ahead of mine. But I wasn't sore; after all it was unfortunate that HI's site had been spammed by some moron who probably had too much time on his hands and too little to do. So, as I'm sat here writing this post, voting had closed some three hours ago. Whilst I did not qualify automatically for the next round, I'm still hopeful - by virtue of the two wildcard slots mentioned earlier. And until the final 16 winners are announced 13 days from now, I'm keeping my fingers crossed. It's been fun, it's been extremely educating and it's been one helluva roller coaster ride. Having finished the race 83rd worldwide and 36th in the Asia Pacific region, I'm happy with what I've achieved... thus far, that is. I could still win. Successfully garnering some 140-odd votes off 380 good people on my Facebook friends list isn't a bad return by any stretch. If I've gained anything out of the whole thing, it's knowing that I have friends out there who'd support me without a second ask. 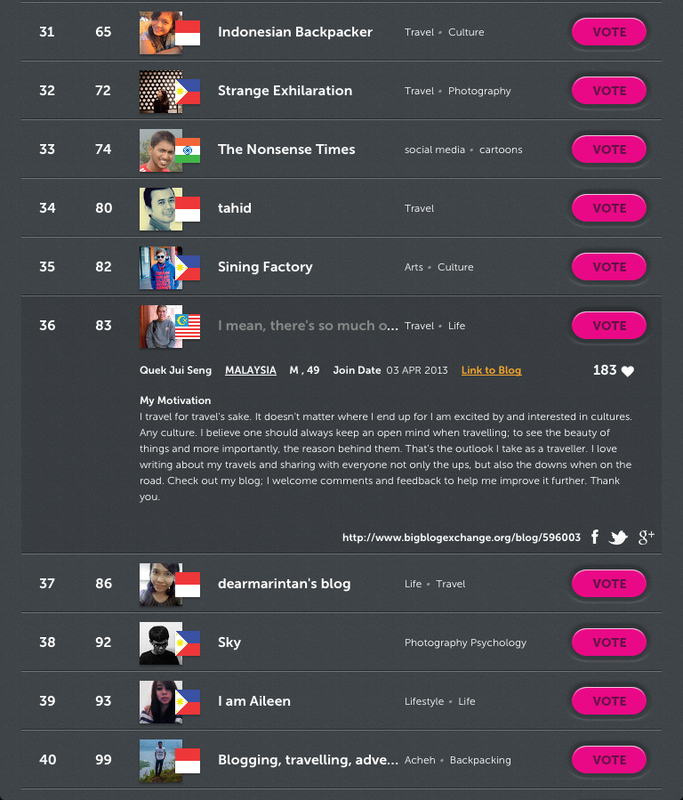 I've also come to learn of many talented bloggers throughout the world - particularly from Malaysia. And that's priceless. To the 100 who've automatically qualified from the four regions, my sincere congratulations. To the 1000+ of us who did not, good luck to all; any two of us could still make up the two wildcards. But I'm hoping I'll be one of those. Kudos and thank you, HI... thank you so, so much for the adventure. Do organise another one next year. I promise I won't be deleting anymore emails without first reading their contents; Rolex, Viagra or otherwise.